FEULING has designed its Econo performance Beehive valve springs to handle up to 585in lift camshafts, while costing less than other comparable springs. The Feuling beehive springs are made from the same premium stress relieved conical ovate wire as its high load springs, but are developed for economical engine budgets. Feuling's Beehive valve springs use a much smaller and lighter weight retainer, which is claimed to drastically reduces the valve weight, creating a much quicker revving and smoother motion than comparable dual valve springs. They allow up to 585in lift cams with no rocker box clearancing required. The valve spring kits include Feuling Econo beehive valve springs, lightweight seven-degree steel retainers, machined heat-treated chrome moly spring seats, seat shims and valve locks and a set of Viton valve seals equipped with a spring loaded valve stem wiper system. 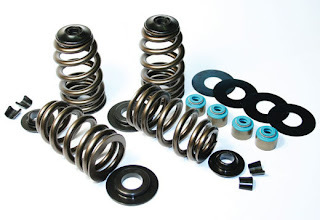 Feuling Econo Beehive valve spring kits are direct replacement with no machining or rocker box clearance required up to .574in lift for '84 - '04 Big Twin and '86 - '03 XL with seven-degree, standard 5⁄16in valve stem and keeper groove and up to .585in lift for '05 - '12 Twin Cams with seven-degree, 7mm valve stem with stock triple keeper groove.